About a month ago I bought a used Airspy and have been using it with good results since then. Anyone who's been following this blog knows I've been in search of the most frequency stable SDR setup I could build or cobble together for several years. I think I've finally come up with a combination that meets my requirements. I am an avid CW operator on the Ham bands. So any drift from an RTL, Funcube, HackRF, Airspy setup makes it a hassle to continually re-calibrate HDSDR for the drift-of-the-moment. Some setups (even the Nooelec TCXO RTL) drift way to much to be useful and practical for CW operation. My setup is like this. My Primary Transceiver is a Yaesu FTDX-5000. It comes with a 9 MHz IF output on the back of the radio. This is then connected to whatever I'm using as the SDR to feed HDSDR software with IQ data in order to visualize the band I'm on. 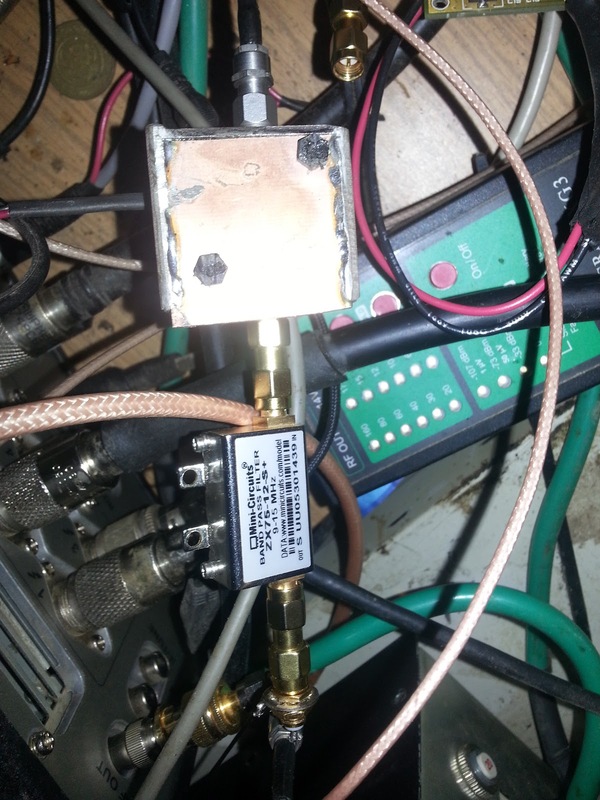 Since 9 MHz is lower than most of the Cheap SDR's can tune to (most seem to stop around 24 MHz for the low end) I've needed to use an HF Upconverter. The commonly available upconverters have drift of their own which further exacerbates the overall displayed drift. Total drift on some setups has been as much as 1khz! So when I'm using narrow filters, and trying to click-tune to a signal I see I end up way off the actual signal, and have to fiddle around to try to get zero-beat on it. I spend most of my time on 50 MHz, so this 'fiddle-time' can mean the difference between coping a callsign, and never hearing it again. After reading reviews and doing a little research on the Airspy SDR I decided to buy one. Two major factors for me that seemed encouraging are that the Airpsy is a 12 bit SDR instead of only 8 bit. This a huge difference. The other was that the Airspy has the ability to be 'clocked' by an external 10 MHz source. It so happens that I have a Jackson Labs "Fury" GPSDO which uses GPS to generate an accurate 10 Mhz Sinewave as a clock output. 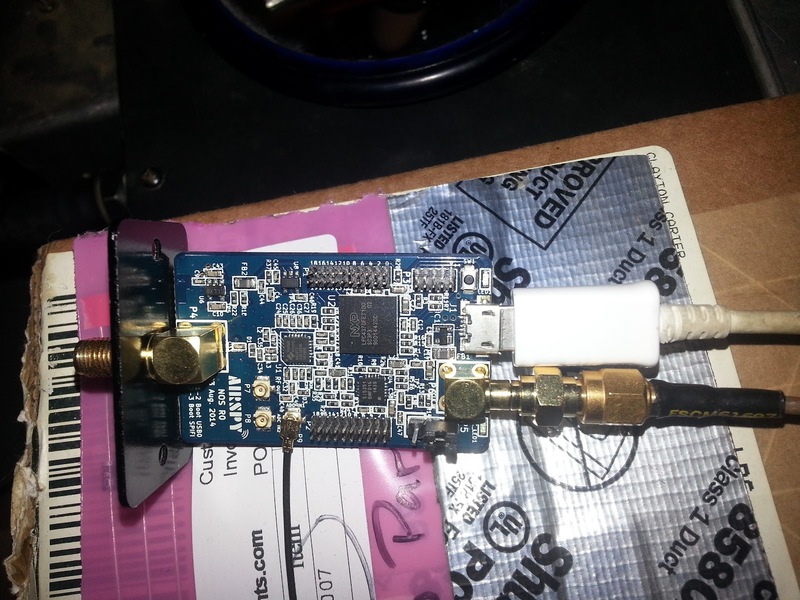 This is then connected via an SMA<>MCX connector and plugged into the Airspy. The Airspy detects that the signal exists and syncs it's internal clocking to it which causes it to never really deviate (drift) in frequency. I have yet to see it drift using this setup. The trouble that still existed was that I still needed to use an upconverter to get my 9MHz IF into a range that the Airspy would receive. I recently read that it was possible to connect an HF antenna to the "ADC1" port internally on the Airspy. I read that there was also some special Firmware developed to enable use of the ADC1 as the Airspy's input. So I bought a cable with the proper connector to fit the port on the Airspy, I connect that to an band pass filter, and the filter connects to an LNA which then connects to the 9 MHz IF out from the FTDX-5000. I flashed the firmware on the Airspy with the special firmware to enable use of the ADC1, and talked IW0HDV into creating a special EXTIO DLL that would UNLOCK the low end (HF<24 MHz). He sent me an experimental version this past weekend and today I set this all up as I just mentioned. And wah-lah! It all works. Note the small coax and connector at the bottom of this picture. 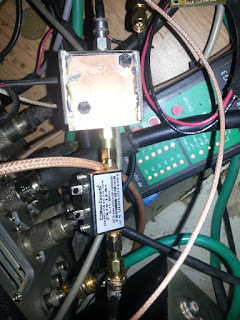 This is the connector and coax that runs from the ADC1. The MCX/SMA on the right side is the GPSDO input connector. The white cable is the USB for the Airspy. NOTE: that the normal SMA connector is not used. Bottom of the image shows the Mini-circuits BPF (band pass filter) above that is the LNA HF http://lna4hf.blogspot.com/ top of the image runs directly to the 9 MHz IF from the FTDX-5000. Stay tuned for some more images, and possibly some video of HDSDR running with this configuration. After a few weeks of testing a few very strong openings on 50 Mhz (40/s9 type openings) I realized that I needed to be able to control the signal strength input to the Airspy. I tried to simply add a 30 db step attenuator inline, but as soon as I added as little as 1db all signals would drop out on HDSDR. I contacted W9RAN who was the first I'd seen attempting to use the DDC method to operate the Airspy on HF. After some discussion I decided what I need to try to do was to increase the gain, and see if I could use the step attenutor without signals completely dropping out. I added a 34dB+ gain Miteq LNA which covers 1-100 MHz. And a static 10dB minicircuits attenuator. This sould give me about 24db gain to play with. And I can then attenutate signals to -6dB below what is coming out of the FTDX-5000. The point being I need to be able to see weak EME type signals but be able to attenuate way down when need be. This seems to work. I can operate the 30 dB step attenuator all the way through Max from 0 without having HDSDR completely drop out. I have a second 30 step attenuator I may attempt to add to the chain for those extremely strong 50 MHz openings. On HF I have a lot of local line noise garbage, but this'll give you an idea how it works at least. I mostly work 50 MHz here. Also I don't use the Audio output form HDSDR except to feed IQ to CW Skimmer. So I don't normally use the audio out to 'listen' to. It just gets piped to VAC and on to CW Skimmer. I'm also seeing some images in this that are probably coming from up-band, so I'll be working on a better pass band filter for this. Also this demo doesn't really show you what I was most concerned with unfortunately; that being freq drift of the TCXO RTL vs. Airspy. But I'll just note here that the drift is ZERO. Nothing I can detect anyway. It works perfectly for my needs.